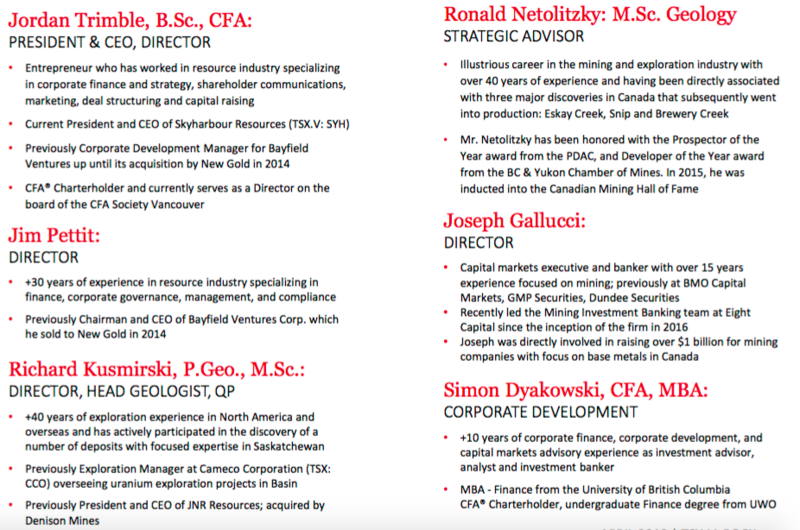 Rockridge Resources (TSX-V: ROCK) is a new copper + base metals explorer, [25.4M shares outstanding, C$6.5M market cap, C$2M cash, C$4.5M Enterprise Value] searching in Canadian jurisdictions. More specifically, the focus is base, green energy & battery metals, of which copper is all three! Not just any place in Canada, world-class mining jurisdictions such as Saskatchewan. And, not just good jurisdictions, but in mining camps with significant past exploration, development or production in close proximity to key mining infrastructure. Rockridge wants to avoid project risks like; [geopolitical, (lack of) infrastructure, security, skilled labor, community support, etc. ], so that it can better capture the anticipated upside in the price of copper, plus select other metals. For true copper bulls like Robert Friedland & Gianni Kovacevic, this isn’t about US$3/lb. copper going to US$3.5/lb. by yearend. No, we’re talking about a longer-term price of between US$4-US$6/lb., starting as soon as 2020 or 2021. In that scenario, if it transpires, you want to be in companies EXACTLY like Rockridge Resources. 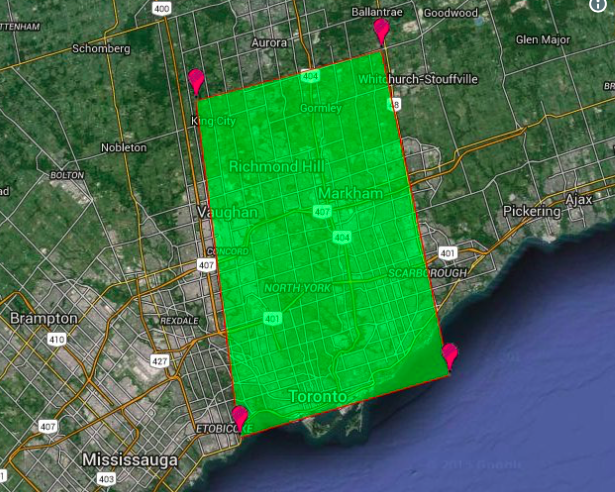 85,000 ha is pretty damn big, see the green-shaded image above. 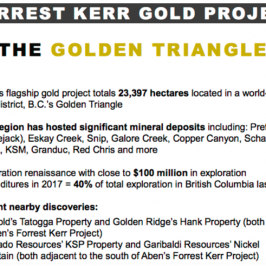 Flagship project Knife Lake is the kind of asset Rockridge Resources wants to own. It’s large, and in Saskatchewan, (ranked #3 of 84 global mining jurisdictions in the latest Fraser Institute Mining Survey). Over C$1.6 billion has been invested into roads, rail, power & water infrastructure to facilitate rapid development of discoveries. In 1997, Leader Mining published a (non NI 43-101 compliant) resource estimate on the shallow deposit. Twenty million tonnes (“Mt“) grading 0.6% Copper, 0.1 g/t Gold, 3 g/t Silver, 0.06% Cobalt & 0.11% Zinc. A high-grade zone contained 11 Mt at 0.75% Copper. 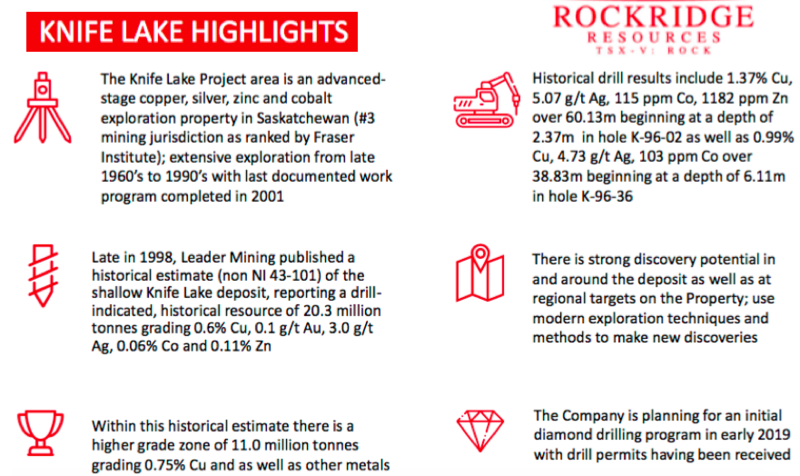 Historical drilling includes a hole with a 60 m intercept of 1.37% Copper, 5.1 g/t Silver, 115ppm Cobalt & 1,182ppm Zinc. 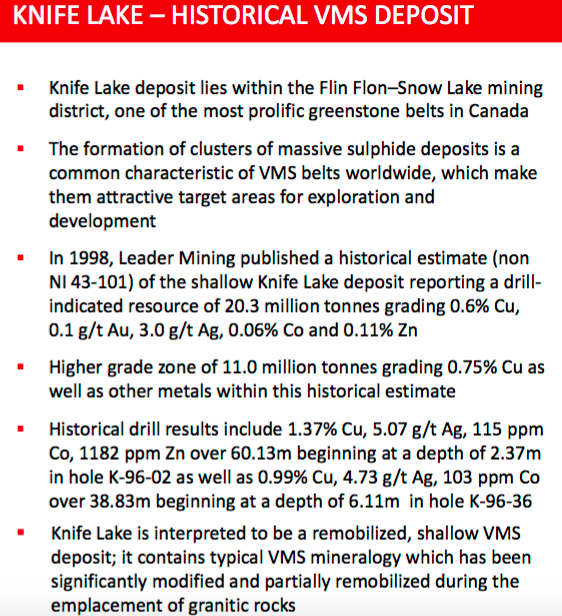 The Project is within the word famous Flin Flon-Snow Lake mining district that contains a prolific VMS base metals belt. Management paid < half a penny/lb. of copper and they believe there’s tremendous exploration upside. The goal? High-grade discoveries in a mineralized belt that could host multiple deposits, as VMS-style zones often contain clusters of mineralized zones. Of course, the trick is finding them. No modern exploration, drilling or technology has been deployed at Knife Lake. It was discovered 50 years ago and last explored in the 1990s. Airborne geophysics, regional mapping & geochemistry was done. 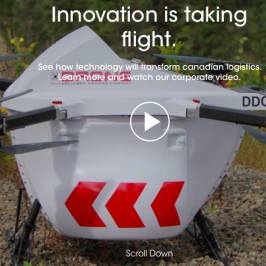 Management believes that modern geophysics; high resolution, deep penetrating EM & drone mag surveys to cover large areas in detail, could make a big difference. Knife Lake is an exciting project, it’s open along a 4.5 km strike length and at depth. There has been a significant amount of historical drilling, 428 holes, 41,179 m (average 96.2 m). Most historical drilling barely scratched the surface, with relatively few holes reaching below 100 m. Of the holes that went deeper, several encountered mineralization at around 300 m. Between 1968-72, 87 holes were drilled, a total of 8,484m, but there was no follow-up until nearly 20 years later when 24 holes were drilled in 1989. Those holes were accompanied by extensive geophysics (with (now) 30-yr old technology). Seven years later, Leader Mining took over and drilled 317 holes from 1996 to 1998. Leader must have thought the property was quite promising to drill that many holes. The only problem? Copper prices fell from roughly US$1.20/lb. to US$0.70/lb. during those 2 years! Even as the price swooned, Leader delivered a resource report in 1997, the highlights of which I described 3 paragraphs ago. Since the late 1990’s there has been virtually no exploration carried out. 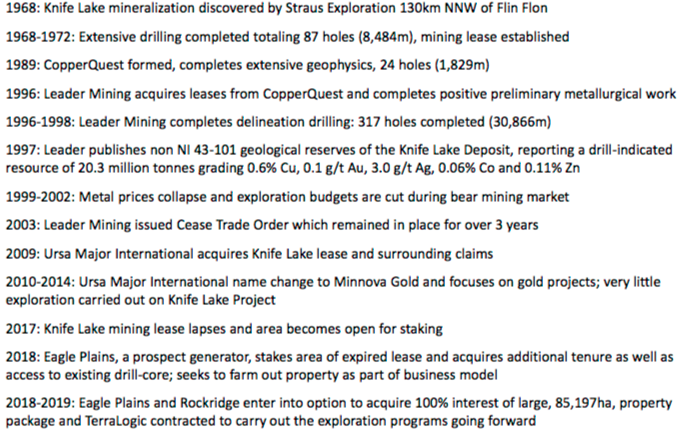 Amazingly, in 2017, the Knife Lake project’s mining lease lapsed. That enabled Rockridge to strike a deal with prospect generator Eagle Plains, the company that staked the newly available ground. Timing is everything, Leader Mining and others tried, but failed to develop this project due, in large part, to weak copper prices. 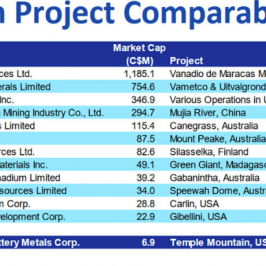 There haven’t been many large, high-grade copper discoveries (in safe jurisdictions) this century. Over 200 copper mines currently in operation will reach the end of their lives before 2035. Most of the largest producing copper mines are several decades old, several date back well over 100 years into the 1800’s! 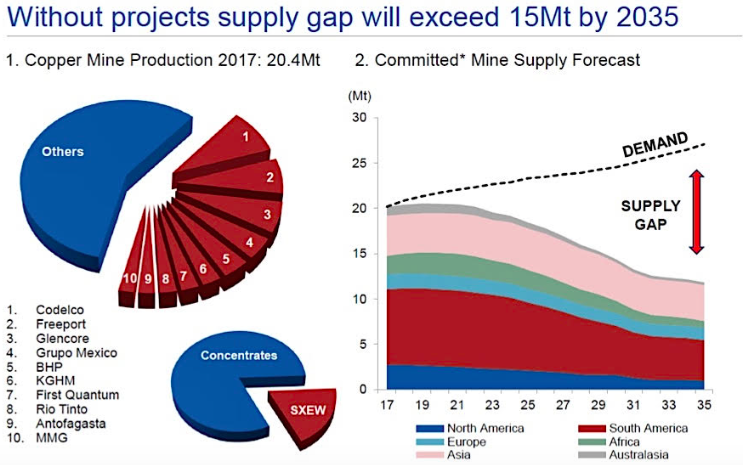 Yet, exploration & development of new mines has been weak, AND, globally, copper grades are in decline. The easy copper has been found and mined. New supply is not coming online fast enough to support the increasing, global electrification of passenger & commercial transportation fleets, and the green energy revolution. Any new power paradigm, anywhere in the world, requires a lot of copper. The switch to renewables like wind & solar, especially for larger installations, necessitates a lot of copper. Since 1900, copper consumption has increased by a strong 3.4% per year. Even an advance to a 4% or 4.5% CAGR in coming decades would be very significant off of such a large base. An EV uses 3-4x as much copper as a conventional Internal Combustion Engine powered vehicle. Global EV penetration is < 2%, we all know where that’s headed. It’s a question of when, not if, penetration hits 10%, 20%, 30%…. The ongoing drill program aims to fill-in some gaps in the historical resource, twin some prior holes and to expand it. A new NI 43-101 compliant Maiden mineral resource estimate is expected later this year. Importantly, there are also several prospective targets to explore for new discoveries. Since the team is drilling what they believe to be a remobilized VMS deposit, that means the main source of mineralization has yet to be discovered. And, as mentioned, these deposits frequently are found in clusters, so discovery potential is significant. 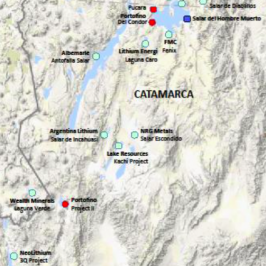 Rockridge Resources (TSX-V: ROCK) is also looking at new projects all over Canada. Although copper is the main focus, CEO Trimble and team will look at any property or project in a good jurisdiction, with access to key mining infrastructure, where they can apply the latest exploration technologies to revisit unexplored or under-explored areas. The Company is cashed up and has a modest valuation. 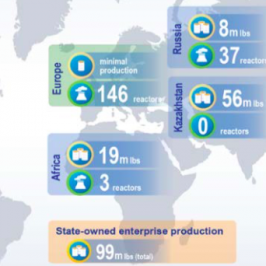 Near-term catalysts include drill results and a new resource report later this year. If copper prices move meaningfully higher, as more and more analysts, pundits, company management teams & consultants expect, a company like Rockridge Resources could be an excellent investment vehicle to capture substantial upside. Disclosures: The content of this article is for information only. Readers fully understand and agree that nothing contained herein, written by Peter Epstein of Epstein Research [ER], (together, [ER] about Rockridge Resources, including but not limited to, commentary, opinions, views, assumptions, reported facts, calculations, etc. is to be considered implicit or explicit investment advice. Nothing contained herein is a recommendation or solicitation to buy or sell any security. [ER] is not responsible under any circumstances for investment actions taken by the reader. [ER] has never been, and is not currently, a registered or licensed financial advisor or broker/dealer, investment advisor, stockbroker, trader, money manager, compliance or legal officer, and does not perform market making activities. [ER] is not directly employed by any company, group, organization, party or person. The shares of Rockridge Resources are highly speculative, not suitable for all investors. Readers understand and agree that investments in small cap stocks can result in a 100% loss of invested funds. It is assumed and agreed upon by readers that they will consult with their own licensed or registered financial advisors before making any investment decisions. 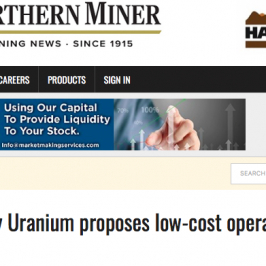 At the time this article was posted, Peter Epstein owned no stock in Rockridge Resources and the Company was an advertiser on [ER]. Readers understand and agree that they must conduct their own due diligence above and beyond reading this article. While the author believes he’s diligent in screening out companies that, for any reasons whatsoever, are unattractive investment opportunities, he cannot guarantee that his efforts will (or have been) successful. [ER] is not responsible for any perceived, or actual, errors including, but not limited to, commentary, opinions, views, assumptions, reported facts & financial calculations, or for the completeness of this article or future content. [ER] is not expected or required to subsequently follow or cover events & news, or write about any particular company or topic. [ER] is not an expert in any company, industry sector or investment topic.